Running in the downtown Tampa area is definitely getting better. 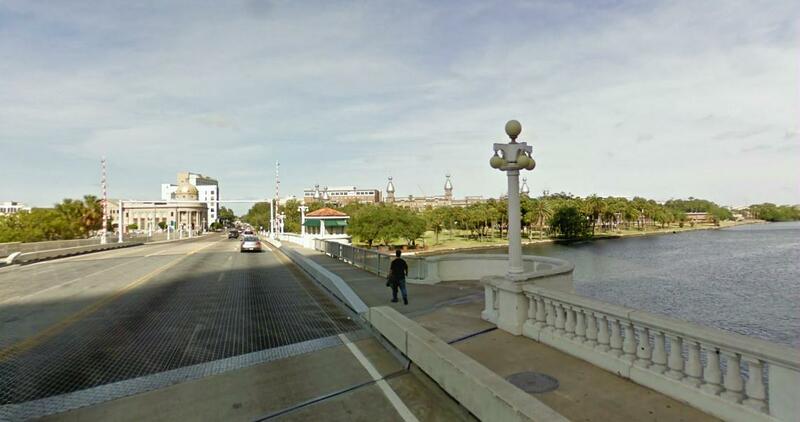 The city's Tampa Riverwalk project, to create a waterfront promenade along the Hillsborough River and the harbor has already added some great spots to run. But the project isn't complete, and there are still large gaps in the riverside walkway. Luckily, there are a few other very scenic spots in the town center, and we'll combine some of them in this run: the University of Tampa, the Hyde Park neighborhood, and the southern part of the new Riverwalk. But first, a few words about Tampa. Like most Florida cities, it's a vast stretch of suburbia surrounding a fairly unexciting downtown. And even though, built as it is on a peninsula in Tampa Bay, it has a long waterfront, there are only a couple of small sand beaches around. Most of the bay around here used to be swampy mangroves, not beachfront. You'll have to head west across one of the causeways to the Gulf of Mexico if you want real beach life. The downtown has been searching for a new lease on life ever since the suburban malls killed off all the shopping in the 1960s. Nowadays the downtown is a quiet collection of banks and lawyers' offices, dotted with parking garages and empty lots, ripped to pieces by the bisecting freeways. In the days when I lived across the bay in St. Pete, I only came to Tampa to see a Bucs- or Rowdys-game, watch an off-beat film at the beautiful old art-deco Tampa Theatre, or to eat out in the great Ybor City neighborhood (see the Destination Tips article!). Slowly, though, new projects are turning the area into a tourist destination: the Aquarium, the convention center, the Forum (a sport- and concert-venue), a cruise-ship terminal, waterfront hotels and the Channelside collection of shops and nightlife have brought back life to the area. May this worthy effort be crowned by success! This run will start right in the heart of downtown Tampa: at the art-deco-style City Hall building, at the corner of Franklin Street and East Kennedy Boulevard. This sleepy intersection was once the bustling heart of Tampa commerce, and Franklin Street was lined with the biggest stores. Face west on Kennedy (towards the river), and start running, with Lykes Park square on your right. In 2 more blocks, you'll pass the cylinder-shaped Rivergate building, known locally as the "beer-can". You'll now run across the old draw bridge over the river. If you look to the right, you'll see the new Curtis Hixon Park, part of the Riverwalk. When you cross the bridge, take the first entrance to the right into the next park, Henry B. Plant Park. Plant was a railroad tycoon who built the railroad to Tampa, and also built the Tampa Bay Hotel resort straight ahead of you. 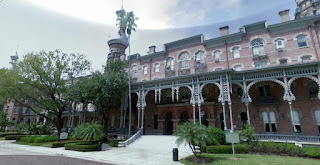 If you run diagonally through the park, past the fountain, you'll run straight towards the strange silver towers of the moorish-style ex-hotel, now part of the University of Tampa. When you're done staring at this fascinating building, turn left and run south down Hyde Park Avenue. 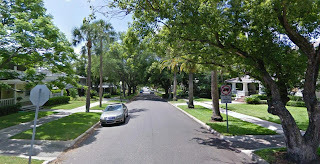 Hyde Park is one of the oldest and nicest Tampa neighborhoods, full of pleasant old homes, huge trees and jungle-like gardens. This is the place where Tampa's dentists, lawyers and brokers live (lucky people!). But first, you have to run along this unscenic business street. Let's get into the neighborhood as soon as we can: When you get to Azeele Street, turn right and run 2 blocks, where you turn left on Magnolia Avenue, and then turn right after one block again at Horatio Street, running west. Now you're on a fairly residential street, and it will get nicer from here on. When you reach Newport Avenue, turn left (south) and just enjoy the scenery from now on. To see more of Hyde Park, turn right on Morrison Avenue to run a few blocks, until Oregon Avenue. Turn left here and run past the pleasant homes until it ends at the pink house at the bayside. This is the turnaround spot for the run. Cross Bayshore Boulevard and turn left, running north along the water, with the water on your right side. This long boulevard is lined with big villas overlooking Tampa Bay. Across the water you can see the waterfront homes on Davis Island. If you're in the area for a few days, I'd also recommend a run through that beautiful island neighborhood as well. Personally, I think Bayshore is too loud, though. So if I were you, I'd turn back into the leafy Hyde Park paradise. After just 6 blocks, just before the shore curves leftwards, turn left up South Boulevard. The water narrows at Tampa General Hospital, at the north point of Davis Island. You'll now run along a stretch of sportboat docks. After the docks, you'll see the downtown skyscrapers looming ahead, and another drawbridge going across to the convention center. Cross the bridge (Platt Street), and turn right at the waterfront walkway on the other side. You will run with the water still on your right side, and the convention center on your left. You're now running along Riverwalk. You'll run under the Harbour Island bridge, running past the Marriott Hotel. After the hotel, there's a park, Fort Brooke Park, location of the first US settlement in the area after the US bought Florida from Spain. The Riverwalk ends at the end of the park, but there are some interesting sights ahead: the aquarium, Channelside, the cruise terminal, and a World War II liberty ship, the SS American Victory. But because you have to run inland a couple of blocks to get there, we'll turn around at the east end of the park and run back to the Harbour Island bridge again. At the bridge turn right and run up Franklin Street the 6 blocks to the City Hall again. The last 2 blocks are a pedestrian way.